Then Jesus came with them to a place called Gethsemane, and he said to his disciples, "Sit here while I go over there and pray." He took along Peter and the two sons of Zebedee, and began to feel sorrow and distress. Then he said to them, "My soul is sorrowful even to death. Remain here and keep watch with me." He advanced a little and fell prostrate in prayer, saying, "My Father, if it is possible, let this cup pass from me; yet, not as I will, but as you will." When he returned to his disciples he found them asleep. He said to Peter, "So you could not keep watch with me for one hour? Watch and pray that you may not undergo the test. The spirit is willing, but the flesh is weak." Withdrawing a second time, he prayed again, "My Father, if it is not possible that this cup pass without my drinking it, your will be done!" Then he returned once more and found them asleep, for they could not keep their eyes open. He left them and withdrew again and prayed a third time, saying the same thing again. [and from Luke 22, verses 43-44: (And to strengthen him an angel from heaven appeared to him. He was in such agony and he prayed so fervently that his sweat became like drops of blood falling on the ground.)] 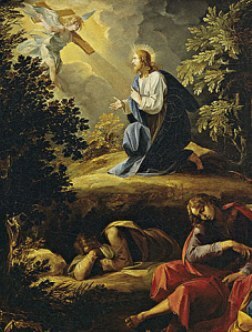 Then he returned to his disciples and said to them, "Are you still sleeping and taking your rest? Behold, the hour is at hand when the Son of Man is to be handed over to sinners. Get up, let us go. Look, my betrayer is at hand". “Such a battle and such a victory became possible only through prayer. It is by His prayer that Jesus vanquishes the Tempter, both at the outset of His public mission and in the ultimate struggle of His agony". (Article 2849 of the Catechism of the Catholic Church). While meditating on the mystery of the Agony of Jesus, pray also for the release of its fruit, true contrition (sorrow) for sin. This concludes the First Sorrowful Mystery. Click here to continue with the Second Sorrowful Mystery.